The core module is the minimal set you need to use eyetracking in UE4. It provides you with all of the low level data that we provide from our eyetrackers. The module is also eyetracker agnostic, so you don’t have to care what model or type of Tobii eyetracker you have, be it a desktop or XR tracker. If you have both a desktop and XR tracker connected, it will pick whichever eyetracker type best matches your main player controller. You can override this behavior by using the SetEyeTrackedPlayer function in the C++ API. The core module is primarily a C++ API, but it does have a blueprint interface as well, containing a subset of the functions found in C++. 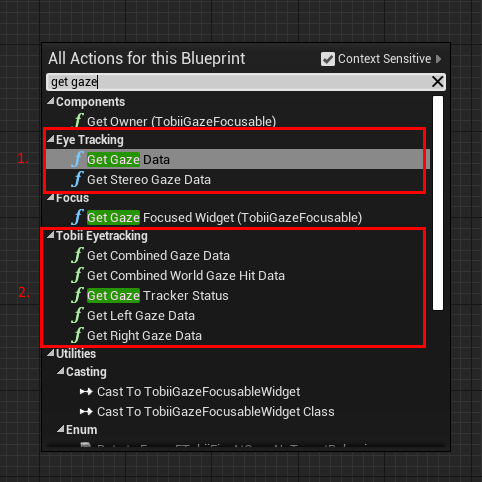 The API also implements the generic eyetracking interface added in UE4.20, but be very careful as the generic functions have very similar names to our API for obvious reasons, but provides a lot less data. The generic functions. These are intended to work with any eyetracker that implements the engine’s interface but supplies limited data. Tobii functions that provide you with the full feature set. The world gaze hit data family of functions will, as the name suggests, provide you with information where the gaze point intersects the world. This will indicate the readiness of the gaze tracking subsystem, which is very useful when trying to determine if gaze features should be active, and how features that support both eyetracking and other interaction should behave. Please note that the “UserNotPresent” in the ETobiiGazeTrackerStatus enumeration is not relevant in XR, so just ignore it if you are not on desktop.